A hard part of learning to skate is deciding which tricks to learn. For today’s article, I’m going to recommend a list of basic skateboard tricks for you to learn. They also serve as a good foundation for the harder tricks you’ll learn in the future. This skateboarding trick is the key to almost everything else. It will lay down the foundation for almost every other trick you will learn, which is no exaggeration. The trick is done by popping the tail, jumping at the same time and dragging your front foot up. Sounds simple right? Practice setting your board on its tail and dragging your foot up. This will help your body get used to this motion and make it natural to you. Practice jumping up as you pop the board. This also helps the motion of jumping as you pop the board natural to you. Practice, practice, practice! No shortcuts, you’re gonna have to work to try to get it down. This trick will take a bit of time to learn because it needs a bit of coordination between your muscles and legs. Check out the tutorial above for a more visual guide. This trick isn’t too hard to learn and is nice to try out once you get your ollie down. You ride your skateboard backward as it goes forwards (this is called fakie) and you do an ollie and rotate your body and board 180 degrees with your frontside (when your toes face forward). Really simple. You first compress and start rotating your body from your shoulders as you decompress. You then do an ollie. The momentum from the rotation should carry you through and turn you. This trick requires a bit of trial and error. Everyone rotates differently and some people need more momentum than others to complete the turn. Some people don’t like starting the turn with their shoulders. You have to find what works for you. Check out the video above for a bit of instruction and visual look at the trick. Place your feet on directly over your trucks. You want to avoid putting weight on the tail or nose of your board. As you approach the thing you wanna jump, get ready and crouch. Jump up lightly and make sure you bend your knees, bending your knees is critical and is just as important as the jump. It helps keep you in control. As you come down try not to panic and stomp down, this can make you lose control and land badly on your board. Come down lightly and bend your knees as you land on your board. There are some nuances on how to perform it and requires a bit of confidence. You’ll definitely have to learn to control your power as you jump and as you land. Check out the video above for more tips. Another simple but a bit harder trick. This requires you to spin your board 180 degrees anti-clockwise and you simply jump up and land down on it. You start by placing a foot on the tail and one on the bolt of the front truck. As you lightly jump back, push out/forwards with your back foot and pull back with your front. Try to keep your board flat through this motion and as you push and pull. Your board should turn and you should be in the air. Land lightly on your board and roll away. It’s a bit tricky to get down, you’ll have to spend some time learning how to time the push, the jump and landing on your board. It will feel super intuitive once you land it though, haha. So, this trick is what people used to jump over stuff before the ollie was invented. You bend down and take your front foot off the board. Put your foot on the backside of the board. Simultaneously, grab the front side of your board with your hand. Shift most of your weight to the foot on the ground and lift your back leg (which is on the tail of the board). Jump with the leg on the ground and bend your leg that’s on the board. You should be airborne now. Time it and place your front leg back on the board and release your grip on it with your hand. You should land and roll away. This requires you to learn how to time it; when to shift your weight to the other foot when to let go of your board as you put your leg back on it etc. Just requires TRIAL AND EFFORT. Super easy to learn and fun to do, this trick is the brother of the Fs shuvit. You stand with your back foot on the tail and the front on the front truck. Push your back leg backward and your front leg forwards and jump lightly. Your board should do a 180 clockwise and you should be able to land on it easy. You can realistically learn this trick in 20minutes. It’s easy and simple to get down. Above you can see Aaron Kyro again making it look easy. Possible the second coolest looking flip in skateboarding? This flip needs some determination to learn it. You should have your ollie down and be comfortable with it. You start by doing an ollie. As your front foot comes up, it starts going towards the backside of the front tail. You then flick your foot out from the base of the backside of the front tail. Make sure you flip upwards and out. Not only either but both. Jump simultaneously as you flick out. You should see the board to a 360-degree flip. Start putting your feet down as it almost completes it flip. You should catch it and land down safely. Definitely the hardest trick on my list, but the most satisfying to learn. This trick is definitely easier with narrower skateboards, though I don’t recommend really narrow boards if you’re a beginner looking for a skateboard for an adult. 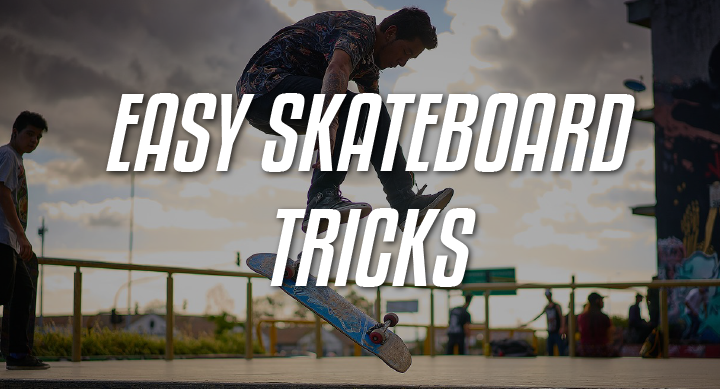 So this basic skateboard tricks for beginners list should set you up perfectly to learn harder tricks like the tre flip, hard-flip etc. They also help you get super familiar and comfortable with your board. You should make it your goal to learn all the tricks above. If you manage to get all these easy skateboard tricks down perfect you’ll have a good arsenal of things to perform for videos, at the skate park etc. The list isn’t really from easiest to hardest and different people will struggle with different tricks. If you’re having trouble getting them down, I recommend finding more experienced people at the skatepark to help you or going to a skate camp.